All PDF files below are 8.5 x 11 inches. 7th Tradition: Where Does the Money Go? To download a compressed (zip) file of all pages above, click here. 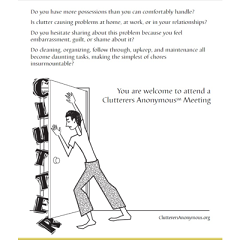 To order a CLA Meeting Starter Kit, including printed copies of all the pages above, plus an initial supply of our recovery literature and newcomers booklet, go to our CLA Store.